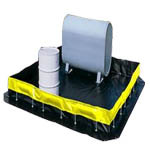 Secondary Containment Products provide a safe secondary measure against accidental spills in your workplace. 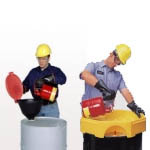 Secondary Containment is a common term used when trying to take precautions against ruptures and leaks of primary drum storage for fluids. 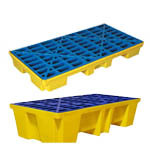 Secondary Spill Containment products consists of spill containment pallets, also know as secondary containment pallets that can hold anywhere from 1-8 drums and provide an adequate secondary spill containment storage system. 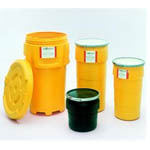 Green State Servicesprovides Secondary Spill Containment Products to help meet tough spill regulations. Ultra-Utility Tray - 12" x 48" I.D. Ultra-Utility Tray - 24" x 48" I.D. Ultra-Utility Tray - 30" x 48" I.D. Ultra-Utility Tray - 24" x 36" I.D. Ultra-Utility Tray - 36" x 36" I.D. 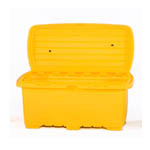 Ultra-Containment Berm, Collapsible Wall Model: 12' x 30' x 1' - Copolymer 2000, 28 oz. 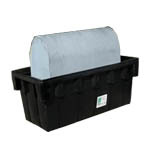 Ultra-Containment Berm, Foam Wall, 4' x 6' x 4" - Copolymer 2000, 28 oz. 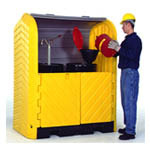 Ultra-Containment Berm, Foam Wall, 8' x 8' x 4" - Copolymer 2000, 28 oz.